In my endeavor to let you know about Indians who made us proud by their works, and Indians who are known for their exceptional services and products in the world, will introduce you, with none other than the founder of Google News Krishna Bharat. Krishna popularly known as "news guy" hails from Bangalore, India. Krishna did his schooling from St. Joseph's Boys' High School, then he went for graduation in Computer science from prestigious IIT Madras (1987 - 1991). After graduation he moved to US and did Ph.D in Human Computer Interaction at Georgia Tech, Atlanta, US. 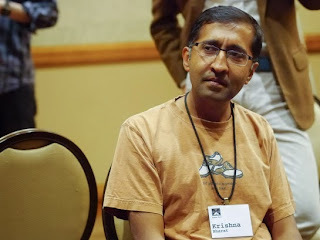 Krishna Bharat is currently the principal Research Scientist at Google Inc. He leads a team of R&D in Bangalore center which he had founded in the year 2004 and he also heads the team of 'Google News' Product at Google US. Krishna is also known for his popular search Algorithm, 'Hilltop Algorithm', he got the patent for his algorithm along with Google, his algorithm Hilltop is believed to be used in Google's search Engine algorithm and plays a vital role in search Engine's Indexing technique.